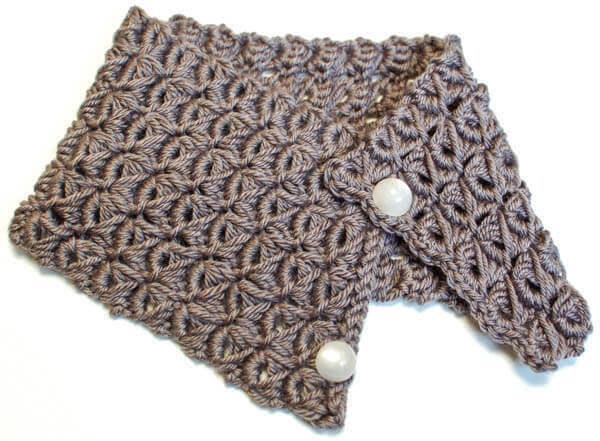 This pretty broomstick lace cowl pattern makes a great accessory for those chilly days. It is also the perfect starter project for those of you who are new to broomstick lace! If you’ve never tried broomstick lace it’s really quick simple and fun to do. You can check out my Broomstick Lace Accent Scarf Pattern here where, although the stitch counts differ, you can get a basic idea of how broomstick lace is worked with the step-by-step photos in the post. If you find video tutorials more helpful you might like this class from Bluprint. worsted weight yarn, approx. 250 yds. 2 or 3 large buttons, approx. ¾ in. Note: Do not turn at the end of each row. All stitches are worked facing front. Row 1: Work 1 sc in 2nd ch from hook and each ch across — 24 sts. Row 2: Put loop from hook onto knitting needle; *insert hook into next stitch on the right and pull up a loop, transfer loop to needle, rep from * across — 24 loops on needle. Row 3: Insert hook through first 4 lps from needle, yo and pull through loops, ch 1 (does not count as stitch here and throughout), work 4 sc in same loops, *inserting hook through next 4 loops, work 4 scs in loops, rep from * across —24 sts. Repeat Rows 2 and 3 for pattern 23 more times or until desired length, ending on an odd numbered row. The loops from your last row will work as your buttonholes. Check the fit of your buttons before sewing them in place. 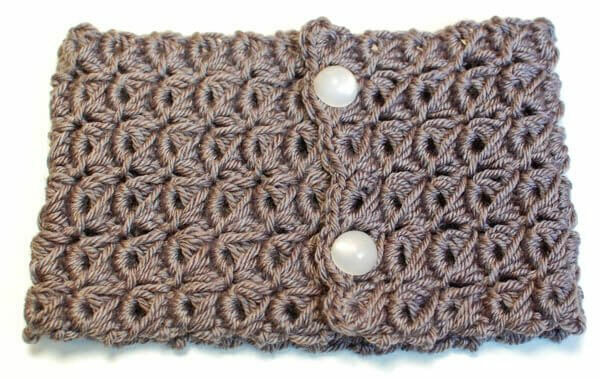 The buttons should easily slide through the loops but not so easily that they will pop right back out once fastened. Line up the button placement along your first few rows and sew in place. Thank you Kara! I need to try this. I’ve never tried the broomstick stitch. Thanks for sharing. Love the cowl, very pretty. absolutely stunning and your instructions seem so clear. i’ll give it a try before screaming for a video as the end result looks quite complicated! This is so pretty Kara!! Very pretty! 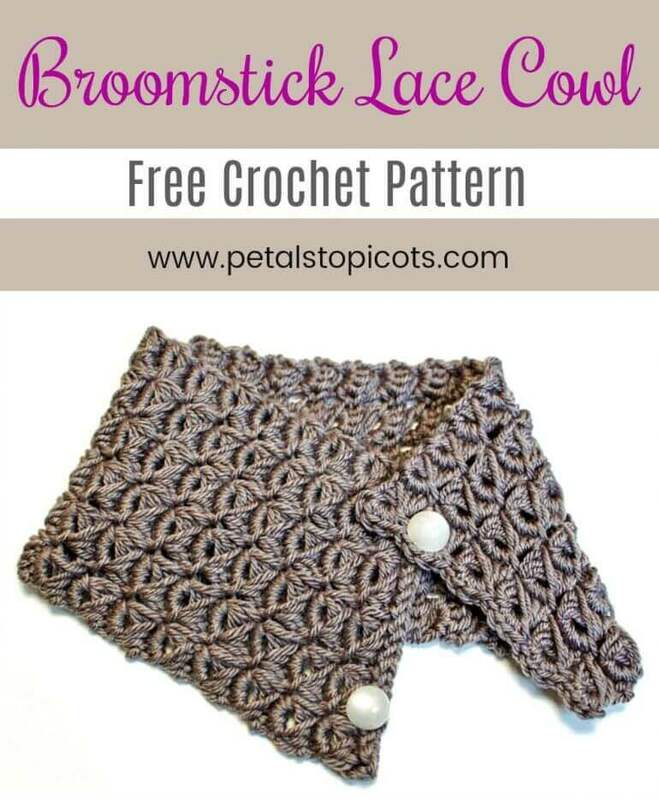 I’ve never tried broomstick lace crochet, but you make it sound simple enough. Thanks for sharing. I love it….long.long time …I don’t use that stitch…pretty though…Love the color . Could you just use a Tunisian hook instead of the hook & knitting needle? I don’t thinks so … you use the knitting needle and hook at the same time with broomstick lace.